This isn’t the most exciting video, but I hope it reminds you of how blue and clear the water is off the coast of KwaZulu Natal, and what it’s like to dive in Sodwana on a good day. It was filmed at the end of a dive on Pinnacles on Two Mile Reef, as the divers approached the boat and waited to hand up their gear. Watch out for Laurine, Esther and Christo! If you aren’t familiar with diving off a RIB (rubber duck), I hope this is a helpful bit of information about how things work at the end of a dive. I’ll share a backward roll video from our most recent Sodwana trip soon, but in the mean time, check out this one to see what it’s like at the start of a dive! 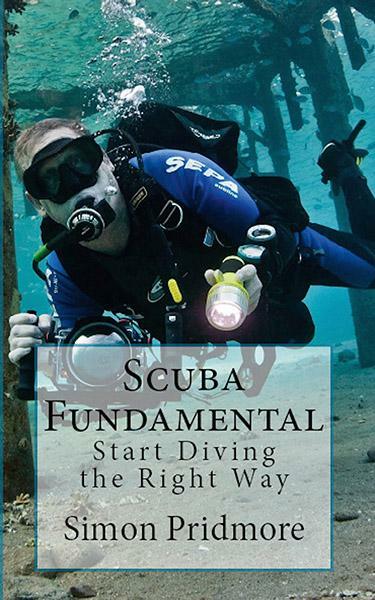 The natural sequel to Scuba Fundamental (though it was written later), this book is aimed at qualified divers who may have reached a plateau with the sport, and want to improve their skills and explore more of what diving has to offer. Author Simon Pridmore does not shy away from subjects such as solo diving, deep diving and technical diving, and offers valuable perspectives from a lifetime in the dive industry. Pridmore begins with a subject that isn’t discussed enough (because it would supposedly scare away potential new divers): safety. He talks about why divers die, survival strategies, and the essential mental preparation that should come before diving. Many divers who have passed the first, awkward stage of their careers on scuba seek to improve their skills. Pridmore discusses buoyancy, navigation, and the touchy subject of deco. The following section addresses some of the specialty options available to divers who wish to extend their qualifications: night diving, wreck diving, drift diving, cave diving, ice diving, and technical diving. While you may decide that some of these types of diving are definitely not for you, there is still much to learn from the techniques and thought processes required to do these types of dives safely. Pridmore also deals extensively with equipment issues, returning to the subject of deploying an SMB, care and use of dive cylinders, mastering your BCD, and dive computers. In many instances, these items of gear are a matter of life and death, and well worth talking about. Narcosis, nitrox, rebreathers and other gas-related subjects round up the sections of the book that pertain to dive safety. The final chapters deal with dive travel, with a section on liveaboards and a recap of some etiquette, which becomes increasingly important when one is diving with people one doesn’t know. 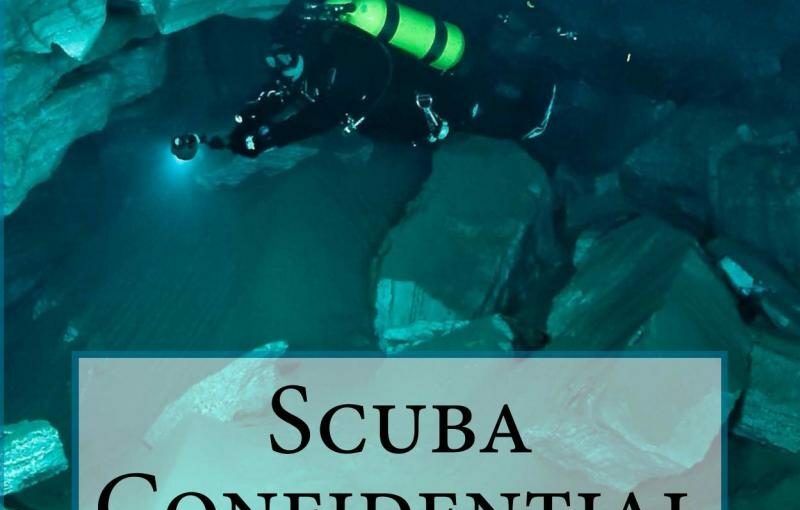 This book will satisfy a growing diver’s thirst for knowledge, draw attention to areas that need improvement or reflection, and prompt further exploration of dive-related subjects. It’s an excellent gift for the curious diver in your life. Get a copy of the book here (SA), here (US) or here (UK). 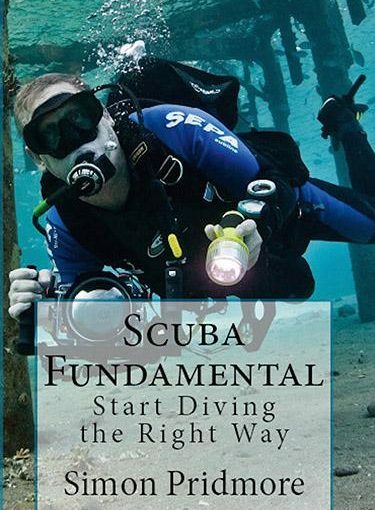 When I first learned how to dive, all I wanted was to find books about scuba diving that were relevant to my stage of knowledge and skill, so that I could learn more (my learning style is by reading). Unfortunately at that time the only books about scuba diving in South Africa that I could find were absolute rubbish (fortunately the situation has improved immeasurably – here’s a quality example). I wish I’d had this book to hand, but it was only published last year, so sorry for me. I read it anyway, with my jaded old eyes. It isn’t specific to South Africa, but it’s written for people who are contemplating learning to dive, who are busy learning, or who are still early in their diving careers. Many of the topics that Simon Pridmore covers are ones that Tony and I tried to deal with in the early days of this blog. He is eminently sensible, and writes from a position of deep, international experience in the dive industry. How does one choose a dive course? How does one choose a diving instructor? When shouldn’t one dive? Which certification agency is best? Should a new diver buy their own equipment, and where does one even begin with that? Once qualified, what next? What about diving in cold water and cold weather? How can divers keep safe on the surface? Pridmore also discusses some important elements of dive etiquette such as peeing in your wetsuit, entry techniques (giant strides, backward rolls, and so on), seasickness, dive boat etiquette, behaviour around marine animals, and what to do if your dive buddy surfaces with a giant booger. 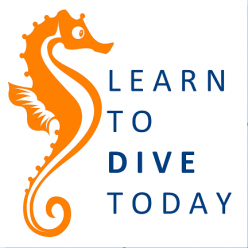 If you’re thinking of learning to dive, are busy with your course, have done fewer than 30 dives, or are just seeking some direction in the early stages of your love affair with scuba diving, consider this guide. 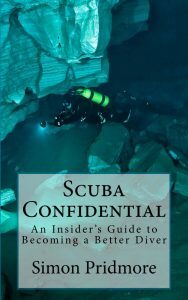 If you have a friend or family member you’d like to start a conversation with about diving, or would like to buy a dive course for but can’t afford it, this book is an excellent starting point. I found myself agreeing out loud with the author’s observations more times than I can count. Get it here (South Africa), here (US) or here (UK). 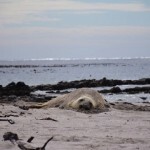 A juvenile southern elephant seal (Mirounga leonina) has been seen around the Cape Peninsula for a couple of months. Almost every year solitary individuals are spotted resting on our shores, but they remain uncommon visitors and always cause a bit of excitement. Their usual habitat is subantarctic and Antarctic waters, including the islands belonging to South Africa and New Zealand, the Falkland Islands, and select parts of continental South America. They feed in Antarctic waters and spend winter down by the pack ice, insulated by tremendous layers of blubber. They are expert divers and can hold their breaths for two hours at a stretch. Southern elephant seals are the largest seals, with the males (which can weigh up to 4,000 kilograms and grow to six metres in length) as much as six times larger than the females, which weigh 400-900 kilograms and grow to between 2.5 and 3 metres in length. At sexual maturity the males develop a big, inflatable rubbery snout (more correctly called a proboscis). This gives them their name, thanks to its rudimentary resemblance to an elephant’s trunk. 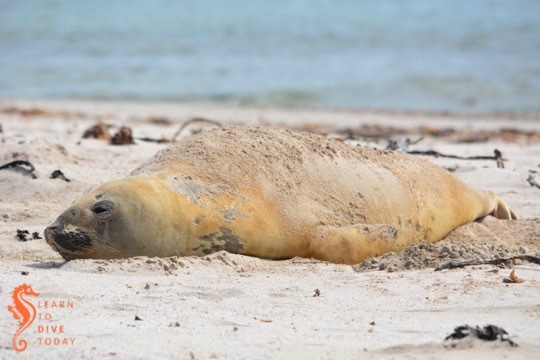 Juvenile seals are weaned and leave their mothers when they weigh about 120 kilograms. At this point they are just under a month old. This particular seal, which we saw hauled out near Cape Point, was at least two metres long already, and was busy moulting. During this time, the seal loses (as you can see in the top image) and regrows its fur. Some of its blood supply is diverted towards its skin to facilitate hair growth. Moulting happens during summer, and takes about a month (because it happens so suddenly, it is called a “catastrophic moult”). During this time the seals stay out of the water and possibly do not eat. 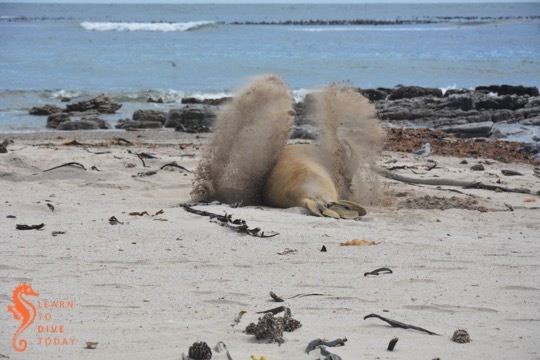 Lying on the beach, well insulated with blubber, can cause them to overheat, so the seal we saw was flicking damp sand over his (or her) back to cool down. As far as their conservation status goes, they are listed as of least concern on the IUCN Red List. They are probably helped by living so far from human activity, although they are still affected by plastic pollution, boat strikes and the like. If you do see one of these animals, don’t be a jerk. Keep your distance (at least 20 metres) and don’t completely surround the seal. This ensures the animal stays happy and calm, and sets an example for others who may not have your good attitude, excellent education and experience with animals. Also, seals can move surprisingly fast on land, and an elephant seal is almost certainly going to weigh a lot more than you do. Tony took these pictures from a respectful distance, with his 150-500 zoom lens. The weekend weather does not look all that rosy so we will launch tomorrow at 8.30 and 11.30. Saturday looks really messy and Sunday looks a little wet. We will launch on Sunday if the weather tones down from the current forecast. Either way, let me know if you’d like to be notified of possible Sunday dives, or if you’d like to be on the boat tomorrow. Just a reminder to make sure your permit to dive in a Marine Protected Area is up to date. Also, if you book a dive please let me know in good time if you can’t take the spot on the boat so that I can give it to someone else. 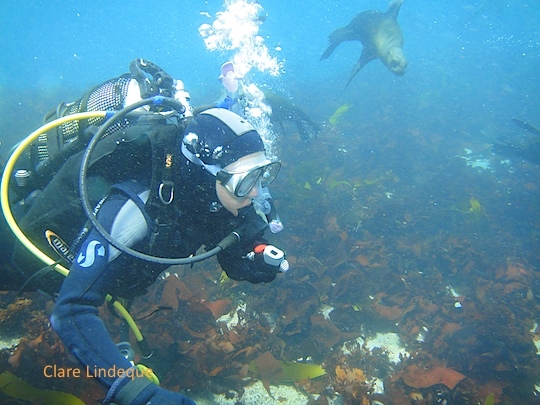 Scuba divers’ and snorkelers’ interactions with Cape fur seals have been in the spotlight recently in light of proposed legislation that would limit us to keeping a distance of more than 30 metres from any group of 50 or more seals. 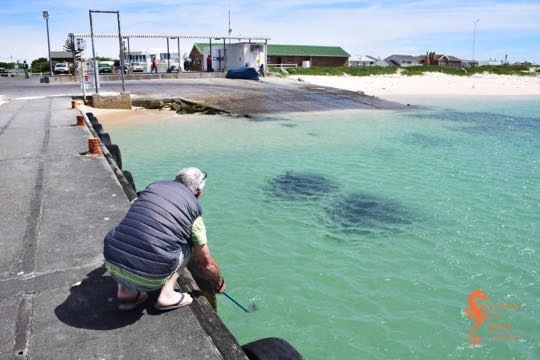 We wrote about the proposed legislation in detail, and one of the alternatives we suggested to an outright ban on approaching seal colonies and haul out spots was the introduction of a seal diving code of conduct. 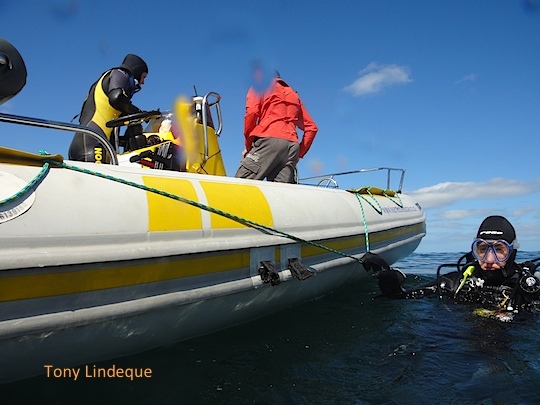 We prepared something similar for scuba diving with broadnose sevengill cowsharks in False Bay. The idea is to draw up a set of guidelines that will ensure the well being of the species we’re diving with, and the safety and enjoyment of the divers. Here’s our seal diving code of conduct. We’d love to hear your comments and suggestions. Is there anything we’ve left out? We are visiting the seals in order to see them in the water. Under no circumstances will we land on their colony, climb onto the rocks from the water, or otherwise harass them on land. We won’t try to chase the seals off their haul out spot or colony into the water by clapping, shouting, or otherwise creating a disturbance when we approach. If the seals want to get into the water to play (which they often do), they will. Seals will interact with us if and when they want to. We won’t use toys such as bits of rope to attract seals to us in the water so that we can photograph or examine them. 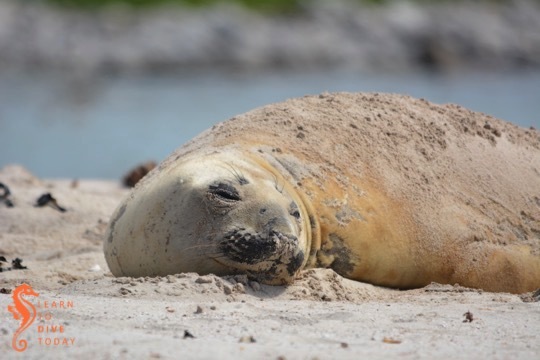 This teaches seals to identify human-manufactured materials as playthings, and will lead to more entanglement of curious young animals in plastic waste. We use no bait or chum in the water around seal colonies (or anywhere else, unless we have a permit to do so). Apart from it being illegal, it could potentially modify the seals’ behaviour around humans, and may attract charismatic marine megafauna other than the species we’re visiting the area to dive with. 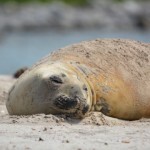 We treat the area all around a seal colony as a no-wake zone. This means the boat engine speed when moving around there is just a little more than an idle, but enough to move forward. When approaching the area, we will slow down well in advance in case other operators have a buoy, divers and/or snorkelers in the water. We recognise that the ocean does not belong to us, and that others have as much right to be at any particular location as we do. This, and concern for vulnerable water users and seals on the surface, informs how we use our boat in the vicinity of a seal colony. 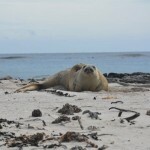 Diving and snorkeling with seals is great fun and a privilege that we have as water users. We’d like to see it appreciated as such, and hopefully this will inform how we interact with these puppy dogs of the ocean. I don’t have a good enough photo of this, but here’s our super skipper Mark – face obscured by a drop of water – in a VERY smart red dress shirt, hauling Kate’s (left) and Christo’s (right) gear out of the water after a dive. He has elevated the standard of dress on board Seahorse to new heights. Luckily for us, Mark had a formal engagement after skippering, and forgot to bring his usual t shirt to wear on board. A couple of weekends ago I picked up a hard copy of this brochure (PDF) at the Paddlers shop in Simons Town. It’s the Marine Recreational Activity Information Brochure published by the Department of Agriculture, Forestry and Fisheries. I wish that more poachers would read it! It has information pertaining to the regulations governing scuba divers, anglers, jet skiers, aquarium keepers, rock lobster, and abalone. The map at left is from this brochure (PDF), which details all the MPAs along our coastline. Certain areas are restricted zones, which means that NO fishing is allowed there at all. I am always totally delighted when the skipper slows the dive boat to a crawl to inform a clueless (or willfully criminal) kayaker or fishing boat that they’re fishing in a no take zone! This usually happens on the way to Smitswinkel Bay in the Castle Rock restricted zone. Research has shown that restricted zones have dramatically positive impacts on fish populations – the difference between fish and marine life populations just inside and just outside these areas is very dramatic. I can assure you, from diving in these areas, that even though the policing of restricted zones leaves MUCH to be desired, the experience of diving in one is an absolute pleasure for the most part. Rich dive sites like Partridge Point are testimony to this. Reading the regulations pertaining to the recreational scuba diving permits that we are required to hold when we dive around the Cape Peninsula (and along much of the South African coast) was enlightening. Most of these are common sense, but it was news to me (for example) that no diving is permitted between 11pm and 4am, anywhere in an MPA! It also put paid to any personal chumming activities… What a pity – I would have loved to have had a great white shark all to myself! By the way, Bird Island – mentioned below – is near Port Elizabeth. There’s a magnificent lighthouse there. not remove, unduly disturb or harass any marine organism or habitat, including shells or substrate, marine mammals, seabirds and fish. not feed fish, practice chumming, or dump any material, or discharge any biological attractants in the MPA. 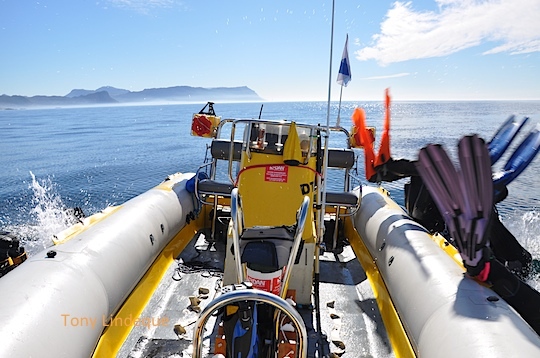 dive in the Table Mountain, Pondoland, Aliwal Shoal and Stilbaai MPA during daylight hours only (from half an hour before local sunrise to the time of local sunset), unless as part of a group being taken out by an DEA-authorised business operator. A representative of a registered Diving Club or individuals must notify the managing authority of the MPA to their satisfaction if they intend night diving. (Table Mountain (SANParks) – 021-786 5656, Pondoland (Eastern Cape Parks) – 047-387 0451/043-742 4450, Aliwal Shoal (Ezemvelo KZN Wildlife – 0825592848). Stilbaai (CapeNature – 028-754 2234). not scuba dive in the Bird Island MPA at all. not dive in any MPA where a scuba diving permit is required between 23:00 and 04:00 at all. abide by the Diver Code of Conduct (www.environment.gov.za). note that these conditions will be applicable to any new MPAs that may be declared, regazetted or required to have a permit in the future. adhere to the condition that boats taking persons diving in an MPA where a permit is required shall only launch from an authorized launching site, and shall not launch earlier than an hour before local sunrise or return later than an hour after local sunset unless night diving in compliance with condition 3. To obtain your MPA permit, take R100 and your identity document or passport to your nearest post office, and ask for a scuba diving permit form at the counter. It’s a blue and white form, the same one as is used for angling, crayfishing, and some other consumptive marine usage activities. Avoid all unnecessary contact or interference with marine life and habitats. Strive to develop and maintain excellent buoyancy control skills. Not take or purchase any souvenirs such as corals or shells. Keep diving sites and launch areas clean. Support service providers that adopt environmentally friendly practices. Obey local laws and regulations. Learn about the underwater environment and the impact of humans on the environment. Dive within the limits of training and experience. Show consideration towards fellow divers and other users. Encourage other divers to follow this Code of Conduct. Help create conservation awareness amongst the local community, general public and diving community. Even a second’s hesitation can combine with one of the above to have you landing on top of another diver. It may not hurt you, but the diver already in the water is unlikely to be wearing a hard hat to protect them from your cylinder! If you miss the count down for whatever reason, WAIT on the boat. 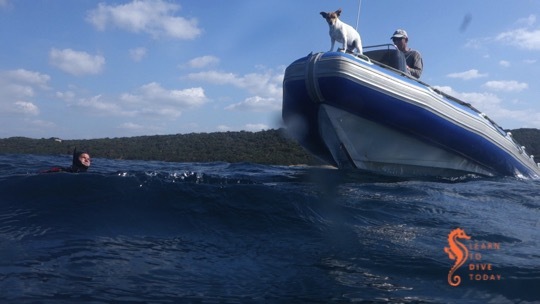 The skipper will bring you around and drop you again when it’s clear. The alternative – rolling into the water on top of everyone else – will ensure that you don’t get invited back for more boat dives! Ever wondered what it’s like to do a backward roll? Check out this video I took at the start of a dive on Bikini, Two Mile Reef, in Sodwana.